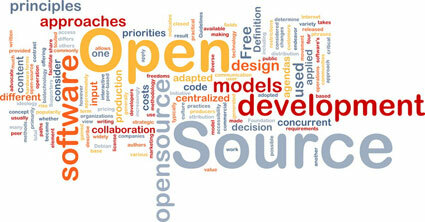 If you have ever looked for software online, then you have probably heard of open-source software (OSS). Most people associate this with free software, but that’s not what OSS really is (though most versions are free or very affordable). Open-source software is software for which the source code is available to the public—meaning there is an entire community of developers that can add to the code or fix bugs. In fact, the plug-ins and add-ons developers constantly create for OSS technology is one of the most popular reasons users rely on it. OSS refers to technology that has its source code open and ready for changes. Most closed software hide the source code so that developers can’t modify and tinker with it. The source code is the programming that creates all of the features, the interface and everything else for the program. You can think of this as the bones, blood and muscles behind the human body that make everything work. Most software developers just let you see the skin, or the outside covering. OSS allows you to dive into the deeper portions so that you can modify the program to your preferences. Both open and closed programs allow for a certain level of customization, but OSS allows you to actually change the programming that occurs behind the scenes. For example, Microsoft Office is a common closed software suite. You can make some customizations, and you can create macros for personal actions that make it much easier to use the software. But you cannot access the programming for features. OSS gives you access to everything; you can add more features to the software, or you can take features away. You can also use portions of the programming language for other projects if you like how a certain feature is coded. Some OSS providers allow you to sell the customized program if it is clearly unique from the original. This differs depending on the provider, and some developers may restrict your ability to sell the modified program. There are various open-source programs on the Internet that are commonly used. Two of the most common for regular users are Firefox and OpenOffice. Another common program for ecommerce business owners is Magneto. This is a powerful CMS that makes it very easy to list, modify and sell products online. Many business owners use a customized form of Magneto to sell their products, and you can hire skilled Magneto developers at Cool Blue Web if you have an online business. A developer will add to the CMS until it is perfect for your needs. There are many advantages to using open-source programs. Most open-source technology is free, or at the very least relatively affordable. This means that you can get great software without spending hundreds of dollars. These programs also tend to have a huge following, meaning that you can easily find plugins and extra features that hobbyist developers have created. The other major benefit is that you can do anything with the software. You can change the source code to your heart’s content. If you don’t know much about programming, then you can easily find a professional developer to do the modifying for you. There are many open-source programs on the Internet that are made for various purposes. If you don’t want to spend a ton of money for a commercial program, then try finding an open-source variant. These programs often rival commercial software and you can modify the software until it is perfect for your needs. Jonathan Martin works on behalf of coolblueweb, a full service web development company.